The start of February can mean a lot of things – the end of the winter months, a nice stretch in the evenings, the daffodils are on the way, and of course, the countdown to Valentine’s day begins! Less than two weeks until V-Day, why not celebrate the occasion in beautiful Balbriggan? With high-quality restaurants and stunning coastal walks and routes, Balbriggan is the ideal place to get romantic this February! If babysitters are in short supply, why not make V-Day a family affair this year, with a visit to Ardgillan Castle! Known as Ireland’s hidden gem, the castle is set in spectacular parklands overlooking the Irish Sea. Bring the kids along to explore the magical Fairy Tree Trail in the gardens of Ardgillan. The trail is dotted around the woodland area of the walled garden and offers visitors a chance to spot the resident fairies hiding in the area! To download your free fairy trail map, click here. Don’t forget, the state-of-the-art playground on the grounds of Ardgillan Castle has over 30 pieces of play equipment, the perfect place to spend an afternoon full of fun and laughs with the ones who really matter. The Harvest Bar and Lounge are offering a Valentine’s menu from February 14th – 16th with some delicious options including pork welllington, baked sea bass, beef, steak and more. For just €22 per person a three-course dinner is available. 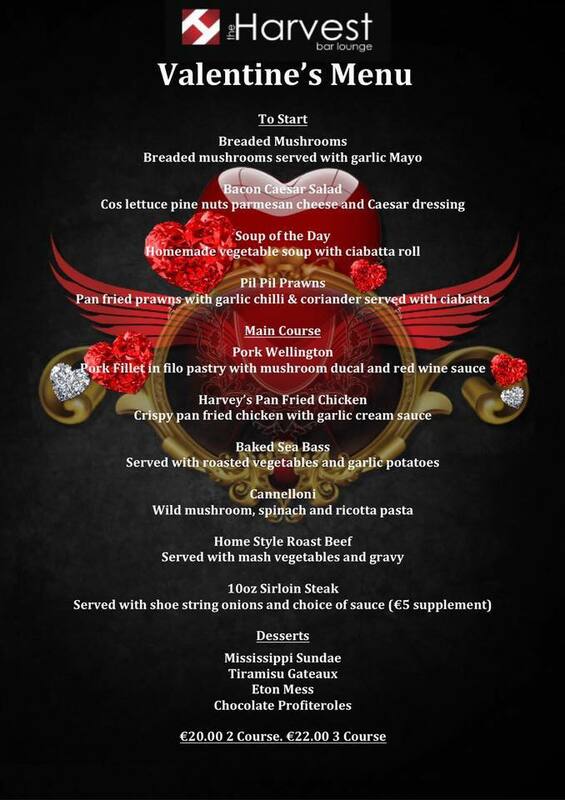 Have a look at the scrumptious menu below! In the spirit of Operation Transformation, why not get out and active this Valentine’s Day with a walk in the fresh spring air around beautiful Balbriggan! Take a leisurely stroll with your loved one on the sandy shores of Balbriggan Beach, or head up to the Harbour take in the scenes. 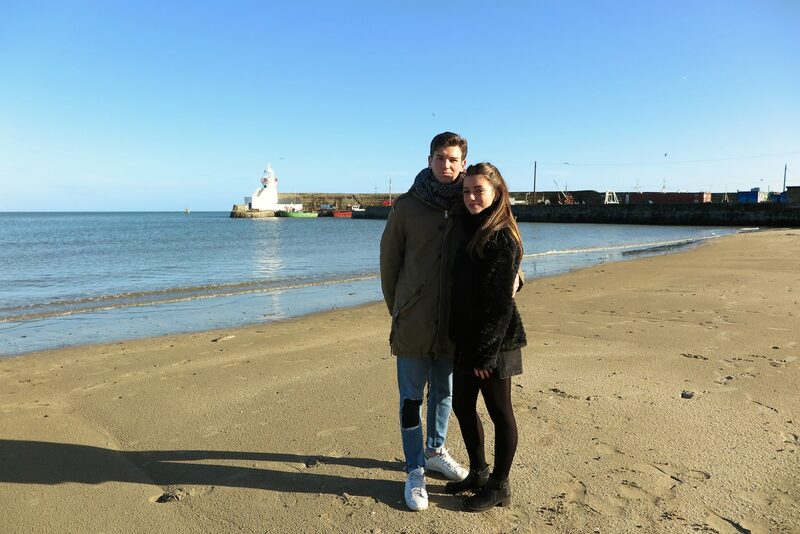 The stunning coastal walk of Balbriggan will lead you passed the impressive Bremore Castle, Martello Tower, the ruins of the Boathouses, Sailor’s Grave, Newhaven Bay and more – the perfect setting for a romantic stroll on Valentine’s Day. If you’re looking to celebrate the Big Day with your loved one in a nice relaxed atmosphere with some tantilising food, Karma Thai is your place! Crack open a bottle of your favourite vino and enjoy the great hospitality of the staff at Karma Thai. With an extensive menu to choose from and each dish bursting with flavour, you’ll enjoy a tasty night out at affordable prices. If you can’t make it to Valentine’s celebrations on the 14th, show some love to your special someone with a bouquet of flowers from your local Balbriggan florist. Visit the ladies at Mayflower Vintage Floral design who will sort you out with a bouquet of your choice for either collection or delivery. The gang at Flowers Now in Balbriggan can put together a romantic arrangement of dreams for your loved one. Man O’War is a traditional Irish restaurant that does traditional Irish romance at its best. Established in 1595 (that’s right, 1595! ), Man O’War knows good hospitality. Enjoy fine wine and craft beer in the superb old-traditional style bar, or book a meal in the restaurant to experience a truly genuine traditional Irish Valentine’s Day. The rural setting, iconic thatched building and relaxed atmosphere will create a unique unforgettable night for you and your loved one.